Autumn 1941. The Russian army flees Kiev, chaos reigns, soldiers attempt to trade their uniforms for civilian clothes in order to escape unnoticed. 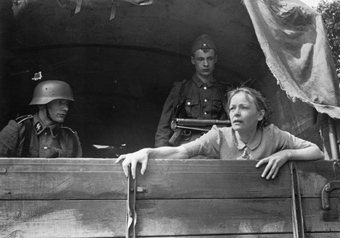 The war and pending capture of Kiev by the Germans is the only topic of discussion. Everyone has heard of the horrible things that have happened in other areas, where Jews were brutally and inhumanely murdered. Indecision and despair spread like wildfire among the population. As the German army marches in, fear and horror take over. Babij Jar is the tragic story of two families' desperate attempt to survive the death and destruction of the Holocaust. Jeff Kanew was from 1966-1978 the creator of trailers for such films as The Graduate, The Lion in Winter, The Good, The Bad and The Ugly, Midnight Cowboy, Rocky, One Flew Over the Cuckoo's Nest, Annie Hall and over 500 others. He has also directed the films: Black Rodeo (documentary, 1972), Natural Enemies (1978), Eddie Macon's Run (1982), Revenge of the Nerds (1984), Gotcha! (1985), an episode of Alfred Hitchcock Presents (TV, 1985), Tough Guys (1986), Troop Beverly Hills (1989), V.I. Warshawski (1991), as well as several episodes of the TV-series Touched by an Angel (1994), and Babij Jar (2001/2002).